I had a brilliant weekend trekking trip at Nam Tok Huai Yang National Park (in Thailand's Prachuap Khiri Khan province) organised by Simon of Travelled Paths. Departing from Singapore, we arrived at Bangkok's Don Muang Airport by AirAsia at around 10:30pm local time. Simon arranged a minivan to take us directly from Don Muang Airport to Nam Tok Huai Yang National Park base camp. If you are arranging pick up from Don Muang, do note that Bangkok has another international airport at Suvarnabhumi Airport. 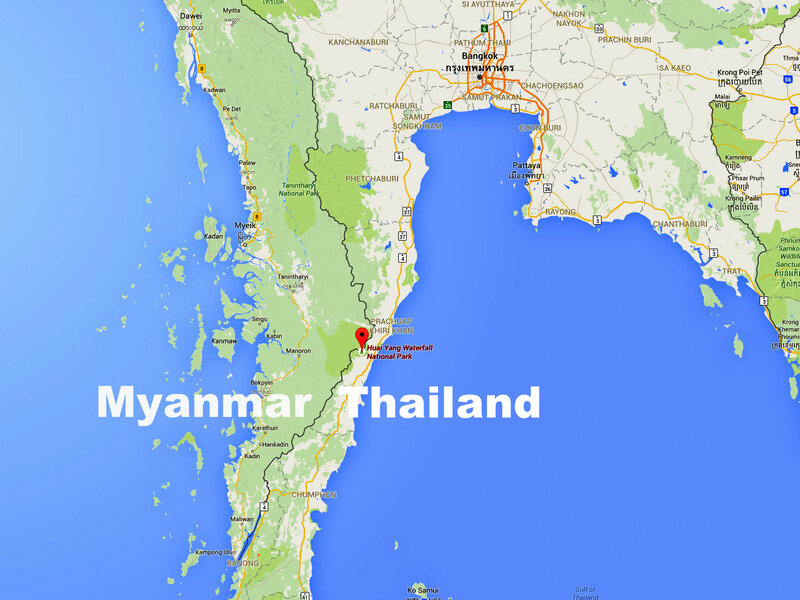 From Don Muang, it is about 350 km (4-5 hours drive) south to Huai Yang National Park base camp. We reached base camp at around 3:00am and rested the night in these tents till the morning. Next morning, awakened by an orchestra of cockerels and birds, we had a simple home style breakfast before setting off. My trekking buddies (clockwise), Aini, Pat, Chueng, Irene, and Simon. We had rice and stir fried chicken with vegetables topped with a fried egg. We also had sides of fried vegetables, fish soup and tang hoon soup. I love the comforting and delicious flavours of Thai home dishes spiked with hot chili, spices and savoury fish sauce. The customary group picture before the ascend. The summit of Nam Tok Huai Yang is 1,350 metres high (Singapore's highest, Bukit Timah is 164 metres high). The trekking trail meandering through rainforest and rock gullies is about 7 km long and takes about 5 - 6 hours to complete one way (10 - 12 hours round trip). Our climb was supported by 3 park rangers, one of whom was armed with an assault rifle (as the park is also the habitat of bears, leopards and tigers). We had two porters and a guide. Support of park rangers and guide is mandatory for safety reasons. One of Huai Yang's famed waterfalls. We were here during the dry season and during an unusually hot spell. There was no view of cascading waters. The ponds among the rocks were teeming with shoals of large Tinfoil Barb fish. The best time to view the Huai Yang waterfalls is between August and January. From this point on, I have no DSLR pictures until we reached the summit (base camp) as I couldn't handle my DSLR and the climb together. My trusted DSLR suddenly felt very heavy and cumbersome to use. I did managed a few shots with my handphone but I found it slow and unwieldy, especially when my hands were greasy with sweat. It also made it hard for me to keep up with the group (as I am already the slowest ;-p ). Time to shop for a sturdy point-and-shoot camera for future treks. (I will write another post of our Huai Yang trek incorporating pictures contributed by my trekking buddies :-D ). Early in the climb, we were confronted with intimidating, steep inclines. Seventy percent of the ascent was made up of inclines, with about a quarter above 45° angle of attack. As this was the dry season, it was hot at above 35°C (my estimate) and most of the time, the sun penetrated the sparse canopy. The track was carpeted with loose dry leaves crackling under our feet like tinder. Our guide told us that we were the last group to use the park this season, which will close due to the dry spell. We were followed throughout the climb by bees and sand flies which were especially prevalent during the hot season. 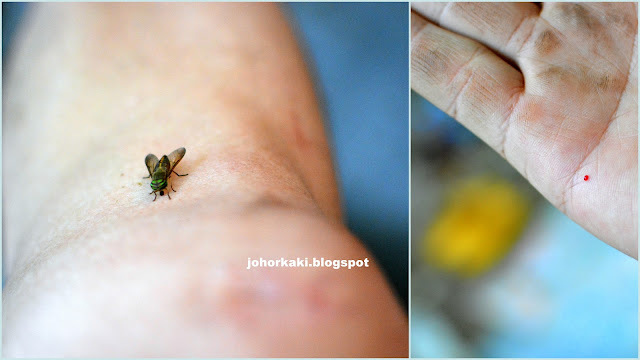 They will visit us with irritating stings whenever we paused to catch our breath, and thus kept us moving ;-D So, insect repellent is indispensable. After 6 hours of trekking and climbing, we finally reached the base camp (near the summit) in high spirits mainly because this was such a fun loving group. Personally, I found the climb quite arduous, especially the early half. Needless to say, the view from here was nice but the ladies seemed to be more fascinated with the man with the gun :-D They were vying to be Charlie's angel. About 7:30pm. From the base camp, we could see the green sea of lush forest with the last orange rays of the evening bearing down on it. There were also bald patches of brown as this was the dry season. The air was shrouded with a slight bluish haze from distant fires set to clear land for planting. While we basked in the orange evening rays, Simon and our gracious Thai hosts were preparing our dinner. The black containers were for cooking rice. I love this simple way of cooking fish. Just rub the fish liberally with salt, with scales on and gut intact. Grill it over an open fire. When cooked, simply lift the salt coated scales and skin, and enjoy the natural sweet flavours in the tender white flesh and hot juices underneath. Stir frying green vegetables, true cowboy style - rifle ready at hand and all. By this time, it was pitch dark and I had to resort to flash to get this shot of the crabs and squid. We also grilled lots of fresh prawns. Aini, a crab lover couldn't resist the freshly grilled crabs as the aroma of baked crustacean filled the camp site air :-D She is an expert in crabs and was patiently extracting the sweet flesh from the crustacean. Bonding over seafood at 1,300 metres above sea level. We spent the night star and moon gazing, and sharing our favourite songs over Youtube. Yes! Incredibly, the Thai Tourism SIM card has data reception here at the top of Nam Tok Huai Yang. 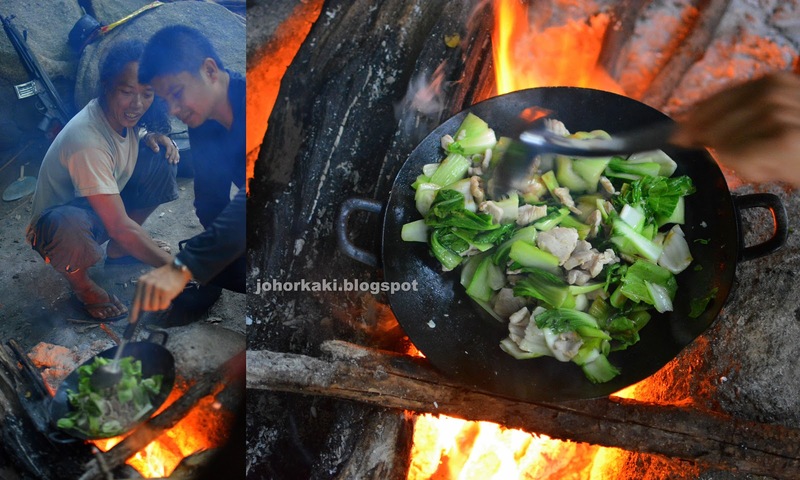 The dinner and camp fire was one of the highlights of our trek. Our drinking water was collected from a tiny stream nearby. At first, I was apprehensive about drinking raw untreated spring water - wasn't sure if my stomach could take it. I drank it anyway as there was no other choice. None of us had any tummy problems at all from drinking the spring water. We slept in these tents for the night under the watchful eyes of the rangers, guide and porters. I was so comfortable, Simon said that my snoring scared away the wild animals. The night was rather chilly (I estimate 15 - 20°C). Snuggled under a light sleeping bag, I wore a short sleeve, long sleeve, a light jacket and long pants for the night. Coffee and toast before our final assault to the peak of Nam Tok Huai Yang. Our gracious Thai hosts wouldn't let us go before another sumptuous and scrumptious meal. One hour of climbing took us to the climax of our trek, the peak of Nam Tok Huai Yang at the edge of Thailand and at the border with Myanmar. From here, we were looking across at Myanmese territory below. After this, it's down hill all the way. The descend posed different challenges from the ascend. Though less taxing on the heart and lungs, the joints and muscles took quite a beating. We had to call on muscles we didn't know we had, to maintain our balance as we negotiated the steep sandy slopes covered with loose dry leaves. 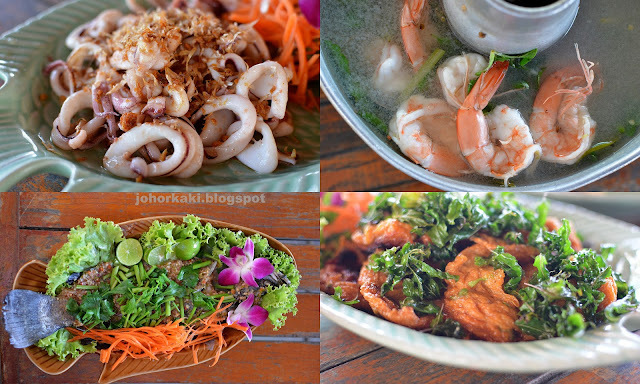 To celebrate, we had late lunch at a little restaurant known as Huai Yang Beach Club at Huai Yang beach which is just 30 minutes drive from Nam Tok Huai Yang National Park base camp. It was our best Thai restaurant meal of the trip. It was extra sweet also because Park Ranger Nat (first left) brought young coconuts from his own home to share with us, after seeing how much we loved coconuts. Again, we were touched by Thai sincerity, graciousness and hospitality. Every dish in this simple meal was brilliant. The clear tom yum goong was one the best I've tasted. The fresh sea bass with Thai sour sauce too was particularly memorable. After the lunch, we drove 5 hours to our guest house in Yaowarat (Bangkok's Chinatown) well in time for our night time food trail of the famed Yaowarat main street - but, I'll save that story for another post :-D All I'll say for now is almost every street food stall or shop here is good - can't go wrong with the food here but prices are relatively high as the main street is teeming elbow to elbow with tourists. At the end of the strenuous trek, I asked my hiking buddies why they chose to rough it out in the hills as the same amount of money could buy them a pampering at a luxury spa. The unanimous response was the exhilaration of adrenaline rush and pleasure of a hike cannot be gotten any other way. My heartfelt thanks to Simon of Travelled Paths for leading the trek and my cheerful trekking buddies for making this a super fun trip to Nam Tok Huai Yang National Park. Simon regularly organises overseas trekking, camping and food adventures. To find out about his future adventures which you are welcome to join, follow Travelled Paths on Facebook. It was great having you on this trek, Tony. You did very well and had a very positive mindset, considering your last major hike was almost years ago. Keep it up and hope to see you on the trail again! I love being in the nature! Currently in training to increase my stamina, wish me luck! yes yes :-D I fell in love with trekking all over again. Looking forward to my next trip. Whoa!! look adventurously fun!! i need this kind of activity once in a while! woah! it is indeed a great site for fun and adventurous activities! we just need to stay away from town sometime, get attach with the nature and green! I haven't had the chance to go to Thailand yet. It sounds so interesting. Wish to go there somedays. Ah! totally like 'The Law of Jungle' trip. Fresh crabs and fresh brewed 100% arabica beans. Gosh! this is awesome. Yes it is really fun. Well worth the effort and time. Hei Tony! Another huge positive about doing a hike like this is the amazing bond one forms with fellow hiking buddies, and special memories we share. Thanks for documenting our journey. It was great fun hiking with ya. We missed you guys on the last walkabout day in bangkok. Take care, and we hope to catch up again soon. Hi Tony, I really enjoy reading this post. And those food looks so good. Mother nature is great! Thank you Joyce :-D Yes I love connecting with nature which we sometimes take for granted. 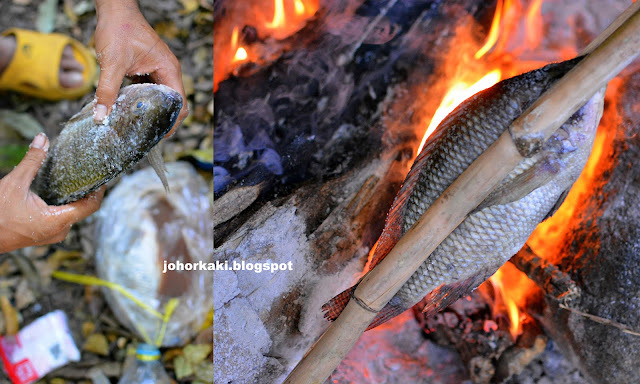 What an awesome time you guys seemed to have - with nature and good food, what more could you ask for, eh? It looks like something I'd want to do as well. Saw the fried egg and I'm craving for it now! wow thanks for introducing this place. i love hiking, and it's best way to explore a place! how much will a trip like this cost? That was really fun, the last time I went for hiking & camping was last year. Its really worth the climb. I love this idea of camping with friends and enjoying the life away from gadgets. This place is beautiful. Is so long I did not go for camping. It must be adventurous to camp at Huai Yang. Generally I will go to Bangkok for shopping..Your idea of going there for trek and camping is actually very nice. Yes! Bangkok and Thailand have so much to offer. Yes, this is a beautiful place. Come during the wetter season when the waterfalls are in full glory. Yes we had a great time together :-D Grateful to have such fun loving trek mates. It was really a pleasure to have this trip with you.Truly enjoyed not only the hiking, but also the street food hopping from one stall to the next. Thank you for the photos and of course the memories! Thank you Aini! Hope to meet up with you soon! Very informative report :-D Thank you. Did you go up alone and without a guide? I gathered that you did not stay overnight?